Watch The Live Telecast Of Kumbha Bharani 2014 on DD Malayalam. 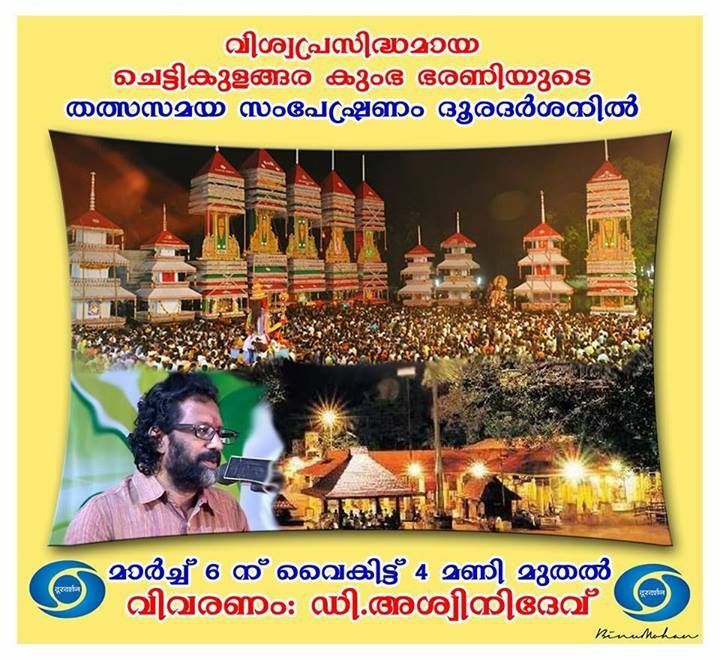 The Live Telecast Will Starts at Thursday, 6th March 2014 at 4.00 P.M. Chettikulanghara Sree Bhagavathi Temple Is One of The Most renowned temples in Kerala. Its Located in Alapuzha District of Kerala. Its Inbetween Mavelikkara and Kayamkulam. Kettukazhcha Is Conducted Every Year. Its On the Bharani Nakshathram of Malayalam Month ” Kumbham “. Kumbha Bharani Is The Major Festival in this Temple. The highlight of this festival is Kuthiyottam and Kettukazhcha.People from 13 karas of chettikulangara will arrange for the construction of Kettukazhcha. Erezha South, Erezha North , Kaitha South, Kaitha North, Kannamangalam south, Kannamangalam North, Kannamangalam Pela, Kadavoor, Kannamangalam Anjilipra, Mattom North, Mattom South, Mattom Menampally, Mattom Nadakkavu are Them.